Baltimore patient dumping: Why was a woman left by a bus stop by Maryland Medical Center hospital staff? Home Scandal and Gossip Why was a Baltimore hospital patient dumped in the freezing cold? 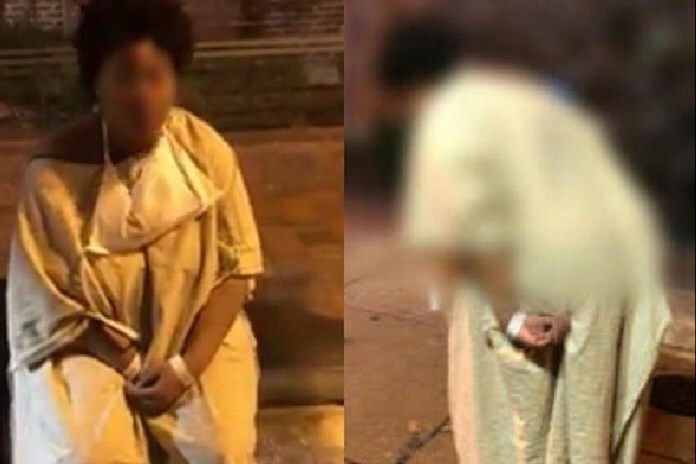 Baltimore patient dumping: Pictured an un-named woman left to fend for herself after being escorted to a bus-stop by University of Maryland Medical Center Midtown Campus security staff. Screen shot as per video filmed by Imamu Baraka. Baltimore patient dumping: How did one University of Maryland Medical Center Midtown Campus hospital patient end up being escorted onto the street in freezing cold and left for dead? 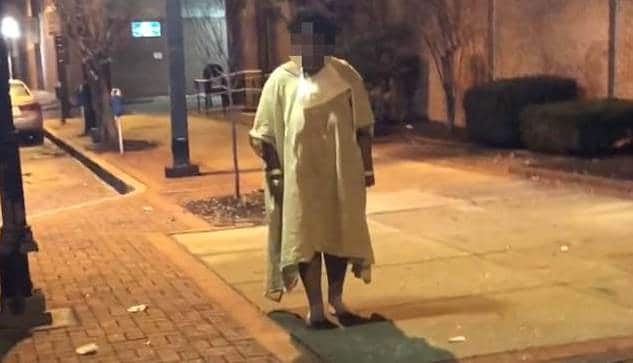 Also making the rounds on America’s collective conscious is a video of what appears to be a mentally ill woman wearing only a thin gown having been momentarily dumped out in the freezing cold by staff at a Baltimore hospital. 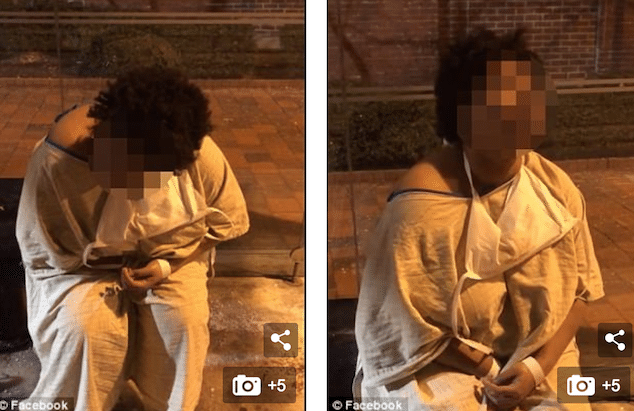 The footage as taken by Imamu Baraka, a local psychotherapist shows the moment the incapacitated individual was left to fend for herself in 30 Fahrenheit degree weather in Charm City, Tuesday night. Baraka’s footage showed the unidentified woman being hustled out of the University of Maryland Medical Center Midtown Campus by four security guards who left her at a bus stop with her ‘plastic bag’ belongings strewn on the street. The hospital workers continue walking back into the hospital. Baraka is seen approaching the woman, who had bloody gashes on her forehead and swaying in place as she yells and groans. A regard of the woman shows her not wearing any shoes, only purple socks, and her loosely tied hospital gown appears to be falling off. Baraka comments it was just 30 degrees out as he filmed himself leading the woman to a seat at the bus stop. He then called an ambulance who took her back to the hospital she had just been kicked out off, he said. Yes kids does it get any more tragic? Baltimore patient dumping: University of Maryland Medical Center Midtown Campus, ‘we’re fake sorry’. The University of Maryland Medical Center Midtown Campus has since verified the video and responded they are ‘investigating’. The hospital spokeswoman declined saying what the woman had been treated for, citing patient privacy laws. Never mind her rights to sanctity, assistance and compassion. Baltimore patient dumping: Left to fend for herself with strewn plastic bags, no shoes, and purple socks. Hospital patient dumping: Against the law, but tell that to medical facilities …. Of note, the Emergency Medical Treatment and Labor Act, a federal law mandates anyone coming to an emergency department to be stabilized and treated, regardless of their insurance status or ability to pay. Hospitals and physicians caught violating the law can face a fine up to $50,000 per violation and are subject to lawsuits. No word yet whether what actions, penalties or suit has been launched against the medical facility …. And then there were these sample comments that caught this author’s attention, see what you think?